One day, I went to have a dinner with staffs of Kamigamo shrine. We heard the story about “SHIKINEN-SENGU” which is now taken placed, and the voices from customers. and it was a very special moment for us to feel afresh of the gratitude which we could support the wedding ceremony in such a historical Kamigamo shrine. From next August, the HONDEN where the god sleep, is going to be restored, so the wedding ceremony would be held at HOSODONO which is registerated as Japan’s important cultural property. The HOSODONO was used as an Emperor’s ANZAIJYO, CHAKUTODEN(which is a temporary palace for an Emperor) in old days, and you could held your ceremony at HOSODONO from August 2012 to December 2017. After this period, next time you could held the ceremony at HOSODONO would be about 50 years later. I think you could spend a solemn moment at Kamigamo Shrine, which is different from the ceremony at HONDEN. By repeating the restorement once in a several decades, Kamigamo shrine has protected their long history from Heian era. I think you could feel how maintaining and passing down the traditional and great history to the next generations is very special and wonderful. 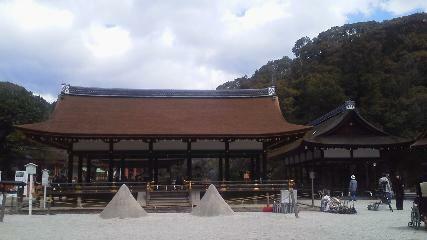 When you go to Kamigamo shrine, please have a look at the construction of HOSODONO.